Nigerians had no rational reason to believe their lives would improve after Goodluck Jonathan became president three years ago this week. The list of promises their rulers have broken is so long it would make a virgin cynical. But then Nigerians can be stubbornly optimistic. When Jonathan first appeared on the political scene in 2007, when Nigeria’s then president, Olusegun Obasanjo, announced him as the running-mate of his party’s next presidential candidate, Musa Yar’Adua, many mythologised the good fortune that seemed linked to Jonathan’s first name. And so, when Yar’Adua died in 2010 from heart disease and Jonathan was handed the most coveted job in Nigeria, many voters believed good luck had come to Nigeria. Were they right? Nigeria’s economy has averaged an impressive 7% annual growth since 2010. Fiscal policy is responsible. The country has a debt-to-GDP ratio of roughly 18% and a budget deficit of under 3%, levels Europe would be delighted with today. This is largely thanks to finance minister Ngozi Okonjo-Iweala, a former World Bank managing director. But Jonathan deserves praise for not intefering. Still, his end-of-year report is not spotless. While the economy is booming, precious little wealth trickles down to the poor. Jonathan must be more energetic about changing that. The electricity supply is erratic, so businesses and individuals spend fortunes on generators and diesel. This in one of the world’s biggest oil exporters. Things have improved since 2010, but far too tepidly: Jonathan only gets a C minus. Infrastructure also remains a problem. Without a modern road network, doing business in Nigeria will remain prohibitively expensive and logistically challenging. Nigeria is a federation: individual states play a big role here. In the richer, well-governed states such as Lagos, where the commercial capital city is located, progress is visible. But Jonathan needs to do more to facilitate modernism in poorer states: he gets a C.
On healthcare, Jonathan gets an F. If a Nigerian gets cancer today and can’t afford private treatment, he will die. Even obtaining aspirin in a public hospital can prove impossible. Education is particularly problematic: tens of millions of Nigerians are illiterate. Most cannot afford an education: without government assistance, thus far feeble, they will remain intellectual invalids. Nigeria’s rulers need to understand that a country is not respected because of the number of oil barrels it sells, but because of the quality of citizen it produces: F.
Jonathan’s record on corruption is a disgrace. A recent report from the US State Department was spot on when it cited “massive, widespread, and pervasive corruption affecting all levels of government”. Asked to disclose his assets, the man whose parents couldn’t afford shoes refused. For emphasis, he said he “doesn’t give a damn” what anybody thinks about it. The Council of States, led by Jonathan, meanwhile pardoned his former boss, Diepreye Alamieyeseigha, who had been convicted of money-laundering. 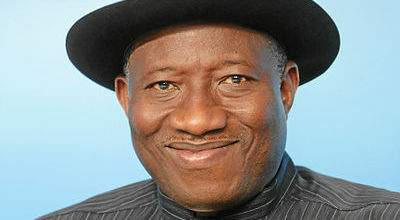 On security, Jonathan has dithered. Boko Haram, the Islamist terrorist group, has killed thousands on his watch, while he seems unsure whether to use crushing force or grant “amnesty” (read: bribes), as he has offered. Boko Haram laughed in his face. It is Jonathan’s government that should plead for amnesty, it has suggested. In a country where the rule of law remains a dream, Jonathan’s message is terrible: he is, in effect, saying: “Prove to us you are strong enough to make our lives difficult and we’ll give you a share of the pie.” How can a president expect loyalty from his citizens if he appears to lack the power to protect them? It’s no easy job running a country that is half-Christian, half-Muslim, underdeveloped and home to some 250 ethnic groups. Some say Jonathan is too weak for the job. But you don’t have to be a great man to be a great president, as long as you are clever enough to you surround yourself with wise advisers, possess the intelligence to process information and have a steadfast desire to improve things for your people. I personally don’t deny that Jonathan some good intentions. But he is hostage to the powerful interests that catapulted him to the top. Ultimately though, he is Mr President, which gives him some pretty sharp fangs. If he wants to be remembered fondly, he should start baring those fangs in the interest of his people. Otherwise, he might as well call it quits in 2015, and spare us a second term. Nigeria has a lot of catching up to do. There is no time to waste.